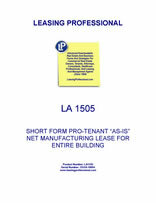 The form is quite short and to the point, without the elaborate provisions often present in pro-landlord industrial single tenant leases that operate to protect the landlord in lease transactions. For example, the agreement contains no security deposit provision. Other Features Tenant responsible for construction and cost of all improvements to premises; Tenant responsible for all maintenance of the premises, including structural and HVAC. No security deposit provision. Please see the Excerpt and PDF Tabs for further information. PREMISES. Landlord, in consideration of the lease payments provided in this Lease, leases to Tenant the land, building and building improvements (the Premises) located at ______________________________. PARKING. Tenant shall be entitled to use all existing parking space(s) for the parking of the Tenant's customers'/guests' motor vehicle(s). STORAGE. Tenant shall be entitled to store items of personal property in and about the Premises during the terms of this Lease. Landlord shall not be liable for loss of, or damage to, such stored items. TERM. The lease term will begin on ____________ and will terminate on ____________________. HOLDOVER. If Tenant maintains possession of the Premises for any period after the termination of this Lease (Holdover Period), Tenant shall pay to Landlord a lease payment for the Holdover Period based on the terms of the following Lease Payments paragraph. Such holdover shall constitute a month to month extension of this Lease. LEASE PAYMENTS. Tenant shall pay to Landlord a total annual lease payment of $____________, payable in advance, in installments of $______________ per month on the first day of each month. Lease payments shall be made to the Landlord at ___________________________, as may be changed front time to time by Landlord. LATE PAYMENTS. Tenant shall pay a late charge equal to $25.00 for each payment that is not paid within ten (10) day(s) after the due date for such late payment. NON-SUFFICIENT FUNDS. Tenant shall be charged $35.00 for each check that is returned to Landlord for lack of sufficient funds. POSSESSION. Tenant shall be entitled to possession on the first day of the term of this Lease, and shall yield possession to Landlord on the last day of the term of this Lease, unless otherwise agreed by both parties in writing. REMODELING OR STRUCTURAL IMPROVEMENTS. Tenant shall have the obligation to conduct any construction or remodeling (at Tenant's expense) that may be required to use the Premises as specified above. Tenant may also construct such fixtures on the Premises (at Tenant's expense) that appropriately facilitate its use for such purposes. Such construction shall be undertaken and such fixtures may be erected only with the prior written consent of the Landlord which shall not be unreasonably withheld. At the end of the lease term, Tenant shall be permitted to remove (or at the request of Landlord shall remove) such fixtures, and shall restore the Premises to substantially the same condition of the Premises at the commencement of this Lease. - all other items of maintenance not specifically delegated to Landlord under this Lease. ACCESS BY LANDLORD TO PREMISES. Subject to Tenant's consent (which shall not be unreasonably withheld). Landlord shall have the right to enter the Premises to make inspections, provide necessary services. or show the unit to prospective buyers, mortgagees, tenants or workers. As provided by law, in the case of an emergency, Landlord may enter the Premises without Tenant's consent. Tenant acknowledges that Landlord has fully explained to Tenant the utility rates, charges and services for which Tenant will be required to pay (if any), other than those to be paid directly to the utility company furnishing the service. PROPERTY INSURANCE. Tenant shall maintain casualty insurance on the Premises in an amount equal to 100.00% of the full replacement value. Landlord shall be named as an insured in such policies. Tenant shall deliver appropriate evidence to Landlord as proof that adequate insurance is in force. Landlord shall have the right to require that the Landlord receive notice of any termination of such insurance policies. Tenant shall also maintain any other Insurance which Landlord may reasonably require for the protection of Landlord's interest in the Premises.